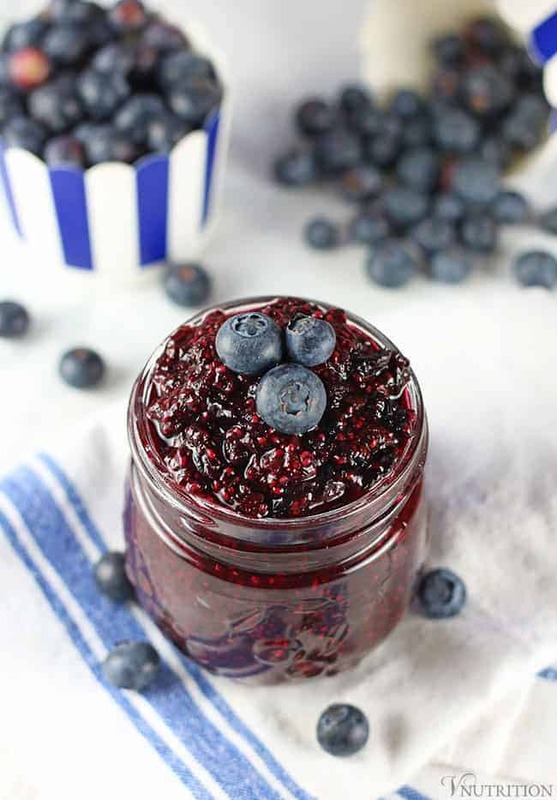 This Blueberry Chia Jam is delicious, easy to make, and refined sugar free. 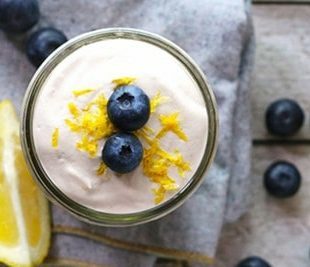 Add it to toast, smoothie bowls, oatmeal, or overnight oats for a tasty pop of flavor! Jam used to be my jam when I was younger (do you like that little joke? I try to be witty though it fails most of the time). Anyway, I would love putting strawberry or grape jam/jelly on my toast in the mornings. I’d take peanut butter and jelly to school every day for lunch too – those were the days before so many peanut allergies. Since I’m vegan, I’m more careful with jam/jelly now because some of them contain gelatin. Many also contain sugar or high fructose corn syrup which I try to avoid as much as possible (more on HFCS below). 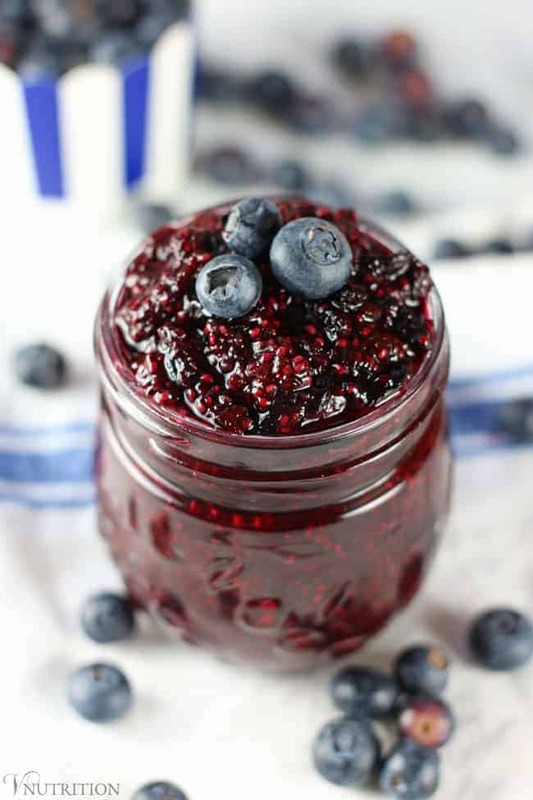 Chia jam is my easy and tasty alternative to store-bought varieties. I love chia jam so much, I made a Strawberry Chia Jam too so I can switch up the berry flavors every few weeks. Did you know that most commercial jams and jellies have a good amount of sugar or high fructose corn syrup (HFCS) in them? Fruit is sweet on its own so I only use a little maple syrup and I’m good to go. Chia seeds are fun to use – not only in the form of chia pets, but also in cooking. They’re one of my kitchen staples. When chia seeds are a put a liquid environment they form a gel which makes a great base for jam. I also use them in baked goods to replace eggs and in my overnight oats as a thickener. Chia seeds are high in omega-3s which and also contain fiber, protein, phosphorus, and calcium. You can also switch up the berry if you’d rather have strawberries, raspberries, or blackberries. I’ve tried each and they all work really well. 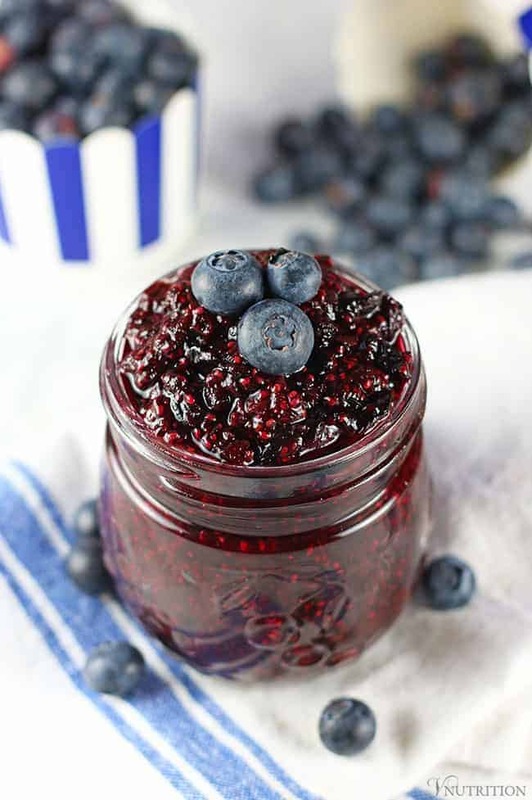 If you make this easy blueberry chia jam recipe, let me know what you think by ★ star rating it and leaving a comment below. Add blueberries to a saucepan and cook on low for about 5-10 mins. Mash them with a fork while they are cooking to break them up. Let stand until cooled, then transfer to glass jar for storage. Jam will last about 2 weeks in the fridge. What would you put chia jam on? Oh my gosh, this looks SO good! I wonder if this is how I can get Darrol to eat chia seeds. He is a blueberry monster and a big fan of you! I hope he gets to try it. The seeds kind of melt into the jam so it shouldn’t be too weird for him. This looks amazing! I love blueberries. And it’s so easy to make! Mary, I use to love peanut butter and jelly sandwiches just like you!! I stopped after going vegan because (i had no idea they contained gelatin), but i knew they were full of sugar and I was making healthier choices!! So happy to see that I can still have yummy jelly made fresh at home. Will try this recipe soon. Yes, pb&j rocks! I hope you enjoy if you get a chance to try it Jen! 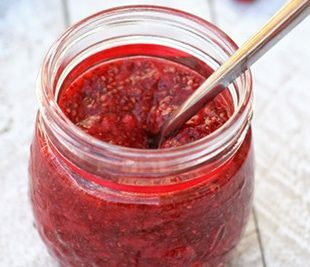 I love making my own jams, and chia is such a great ingredient to make it with! And so true, it’s so much healthier than a shop-bought stuff, which are just full of sugars! Thanks for sharing! Jams are so fun to make right? This looks so good! I’m a big fan of jam, and now an even bigger fan since it’s so easy to make it at home. This recipe is so simple, I love it! 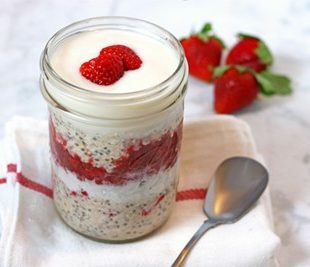 This looks amazing, chia seeds are perfect for jams and I can’t wait to try. Thanks! Thanks Christine! I hope you enjoy! Chia Jams are my jam! 🙂 I love the idea of creating homemade, low sugar jams that are actually healthy too. 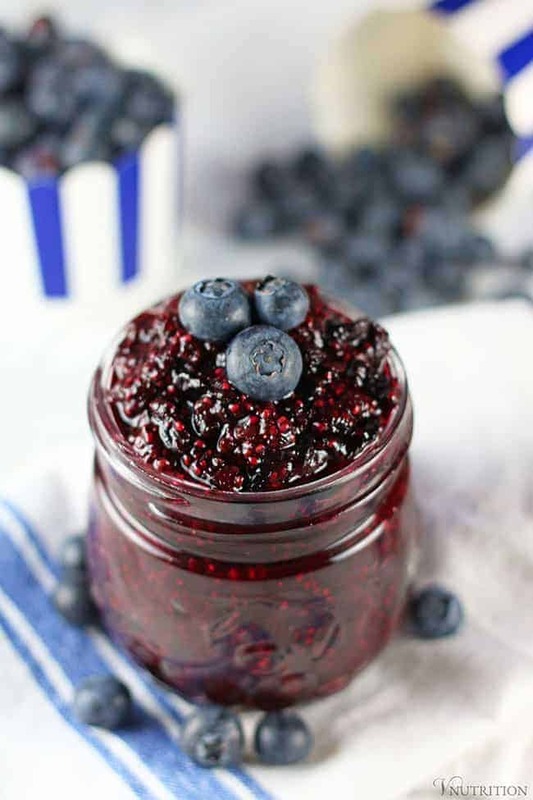 Your blueberry chia jam looks delicious! And guess what? I actually have some blueberries in my freezer that I picked myself! Just call me Martha! Ok. Not really, because Martha would have had the blueberry bushes in her back yard. I went to a farm. Thanks for the inspiration! Marly (aka Martha) love that you’re a “jam is my jam” kind of gal too! I’m very impressed you picked blueberries myself. How I’d love to have a blueberry bush in my backyard! I am excited to try this but have a question. I routinely use a flax/chia blend. Would that work or will the flax seeds alter the final product? Thanks! Linda, I haven’t tried a flax/chia seed blend. Are the flax seeds ground? If so, it could work because ground flax seeds do take on a bit of a gel type flavor like chia seeds do. I can’t promise it would be the same but if you do try it, let me know. I’d love to hear if it works. I love making chia jam! Yours looks beautiful! I bet my boys would love helping me make this! I love chia jams, though I don’t eat it enough to justify making it. They don’t last nearly as long as traditional jams. But I do like how chia jams aren’t as sweet! Traditional jams I’ve never liked because the are just TOO sweet, usually I only like them mixed into other things. “Jam used to be my jam when I was younger” I do like little jokes. You’re adorable. I actually never liked jam growing up, but have come to appreciate it more as an adult. This sounds delicious and I love how quick and easy it is to make. Cant wait to try this recipe! Love the use of maple syrup. thanks Jenny! Hope you enjoy if you get a chance to try it! Hello, My friend is allergic to lemon juice and other acidic foods. Can I omit it from the recipe? She has so many allergies this is the only recipe I could find for blueberry jam that was almost completely safe for her to eat. Hi Katie, yes, it should be fine to omit the lemon juice. It adds a bit of acidity to balance out the sweetness but it should be okay to omit, it just might taste a bit sweeter. Let me know what she thinks! I will definitely let you know what she thinks!! I am just so happy to have found this recipe. I Want her to be able to enjoy some sort of treat at our Halloween party. So I am making Halloween shaped Linzer cookies with the proper Siri friendly ingredients. finding the jam was the most difficult part. So your recipe is a real life saver!! You’re such a sweet friend to be doing this for her. I hope you have a great time at the party and the cookies work out really well! Could you tell me the differences/advantages of using chia seeds over ground flaxseed for a cardiac patient? My husband had a widowmaker heart episode 2 years ago and I now follow the Esselstyn Prevent & Reverse Heart Disease way of eating. He’s been using ground flaxseed over his steel cut oats each morning. I’d love to try this recipe since it follows the Esselstyn guidelines. Is there any real advantage or are they pretty much interchangeable? Hi Iris! In general, both chia and flax seeds are great additions to a heart-healthy diet. I wouldn’t say one is better than the other. Both contain omega-3 fatty acids (flax a bit more but not much) and have a comparable mineral content. I think adding both to his diet would be beneficial. 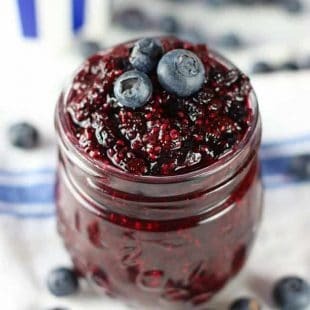 The flaxseed meal on his oats is a great idea and this jam could be a nice way to add a bit of extra fruit and chia to his diet as well. Wishing your husband the best.